“Without strategy, execution is useless. The ability to build a strategy and execute it is what separates the good from the great. How to build an effective social media strategy for your nonprofit isn’t always clear. As I was doing research for this series of blog posts about social media strategy, I could understand why it’s so difficult for nonprofits to build a strategy. Some information was more a road map or a plan for social media and less a strategy. Others weren’t strategies at all, but specific tactics you could use. Still others focused only on social media metrics without acknowledging the necessity of meeting actual organizational goals. What is a strategy if it doesn’t aim for completing the objectives of your organization? This isn’t to say there aren’t good resources out there, Hubspot produces volumes of content teaching social media among other inbound marketing. However, the difficulty in finding, assessing, and implementing these various resources into one coherent social media strategy results in many nonprofit organizations simply doing nothing and executing a few tactics they think will work. Following best practices and engaging in trends certainly can generate ‘good’ results, but we want to build ‘great’ organizations, so we need to develop a strategy that is better aligned with what we want to accomplish as an organization. Only then will you have the alignment you need to meet organizational goals, fulfill the needs of your audience, and do so within your limited budget. In this series, we’re going to build a great nonprofit social media strategy. Before we get too far, let’s talk about the difference between strategy, a plan, and tactics. A strategy gives you a competitive advantage. The strategy may have many plans, or methods to achieve the strategy. Think of a strategy as a blueprint, the plan is how you’re going to build what’s on the blueprint, and the tactic as how you’re going to acquire the materials to build what’s on the blueprint. For a nonprofit, you may have a goal to increase your donor base by 25% this year. The social media strategy to accomplish this goal may be to develop an innovative lead system using peer to peer content marketing. The plan is the step by step build to build this innovative peer to peer marketing system. A tactic within the plan might be to use Facebook Lead ads to build an email audience to market the system to. In this process to develop a social media strategy for your charity, you will likely build multiple plans and then a bunch of tactics to achieve the goals identified by your plans. We’re going to take each component of the strategy step by step to make it easy for your NGO to build a complete social media strategy. Grow Facebook Likes by 33%. Gain, on average, 3 retweets on every post. Build a total social following of 1 million people. There’s nothing wrong with setting goals for your social media metrics. Like any marketing channel, it’s important to know where you are currently and where you’d like to go. What’s missing is the ability to directly connect those metrics with your organization’s goals. For example, if you grow your social following to 1 million followers, what does that mean for the growth of your email file? How many donors will you get from those followers? The missing connection here will result in missed expectations with your executive team and board. At some point, someone will ask the crucial question, the number of social followers is great, but what did you do to meet our business goals? If your strategy doesn’t address this, you’ll be scrambling after the fact trying to link causality, when in reality, it was by luck if you manage to achieve business goals. When you build your strategy up front to address your organization’s goals, you can clearly state your misses and hits and change your plans along the way to meet your strategic objectives. For some organizations, this is going to be simple. You have a strategy that clearly lists your goals and you are actively working towards them. Often it’s a strategy linked to a timeframe (for example, by the year 2020) and it sets a target for each goal. If your organization is tuned into current strategic thinking, you may have multiple types of goals, one being a Big Hairy Audacious goal (BHAG™ by Jim Collins). BHAGs are goals you set that at first seem impossible, but it gives you a big target to shoot for. Have at least 25,000 active donors by end of fiscal year 2020. Build a continuity donor program with 5,000 active donors by end of fiscal year 2020. Acquire $1 million in legacy gifts by end of fiscal year 2020. All senior leadership (Director and above), with at least 1 year completed service, complete leadership training by end of fiscal year 2020. Achieve a +60 net promoter score from donors by end of fiscal year 2020. When you review your goals, you may seem some immediate areas social media can help with. You can help build leads for your email marketing program that will turn into donors, you can create campaigns to encourage interest in continuity programs and in legacy giving, and you can use social media to build a feel of community with donors to help improve NPS. Just think: when you contribute to your organization’s goals, you are proving the value and investment in social media! This is a common situation to be in. Don’t panic. There’s a solution. If your nonprofit doesn’t have goals, you’re going to need to do a little work to create goals for social media. Begin by identifying the departments within your nonprofit organization that have a stake in social media. 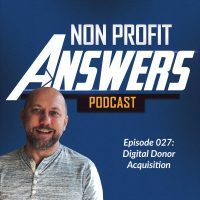 These often include: marketing/resource development, HR, customer service/donor relations, legacy giving, major donors, partners/corporate giving, and IT. Find out what their goals are. These will become the goals you use to build your social media goals. Developing a baseline for each goal will help you create attainable growth goals for these metrics. If you don’t yet have metrics, or haven’t been tracking them, now you’ll know the metrics you need to track to build a baseline, proper goals, and measure the effectiveness of the work you’re doing in social media. You’ll have several more goals listed than the three examples. If you can’t identify a numeric goal, you can simply note that in the goal. For example, Obtain TBD new donors through peer to peer fundraising campaigns. Once you have a baseline, you can update the goal. Identifying what you want to achieve in social media is the first step to building a great strategy. Next time, we’ll learn how to describe the audience we’re building the social media strategy for.